These are GREAT shots! First one's kinda funny, but the rest are just beautiful. Kudos to my hometown. Shania & her family to send out this holiday season?? at The Mark of the Quad Cities!!! when Shania Twain played The Mark. There's a ton of it!! during her show at The Mark. some free advertisement at the end of her show at The Mark!!! to end during Shania's show at The Mark???? Last edited by JAZZ : 03-27-2005 at 02:21 PM. Thanks so much for posting that Sheri! I went to that concert and had 4th row aisle seats, and it was definately a night that I'll never forget! Thanks for bringing back the memories! You're welcome! Found that while I was making Don't requests last night. My favorites (although aren't they all wonderful?) are 2, 5 and 7. Love those close-ups and that confetti shot looks almost 3-D or something. 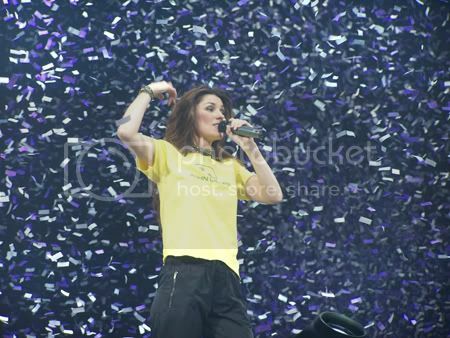 Rare to see the wall of confetti, yet none of it is between Shania and us. Different! When Linda and I had dinner with Shania in Sunrise Florida right before her last "UP" concert she was wearing a yelllow John Deere baseball cap...I wonder if she got it for the concert in the above pictures? At the time both Linda and I wondered why John Deere?...but maybe I know the answer now. Thanks for posting this, Sheri. Great pictures. I noticed that cap immediately from your pic, Debbie. And I knew exactly where she got it. I was at that show...Lots of memories with that trip Like doing 85-87 mph on I-88 on my way there. Turning down 1st row ticket for Omaha following that night. And my favorite cargo pants got ripped while I was paying a toll on the way there. Kringle-is a wonderful butter layered Danish pastry that was first introduced to Racine and southeast Wisconsin in the late 1800's by Danish immigrant bakers. In its original form, it was a pretzel shaped, almond filled coffee cake. They are all excellent for any kind of picture. Wow, Great Pix...Thanks a lot!!! "I guess the headline in the Florida papers should read, 'Guess Who's Pulling for Auburn Now.' "
Great pics, Sheri! Thanks for posting! Awesome photos from that concert..thanks Sheri! They sure bring back a lot of memories!! !